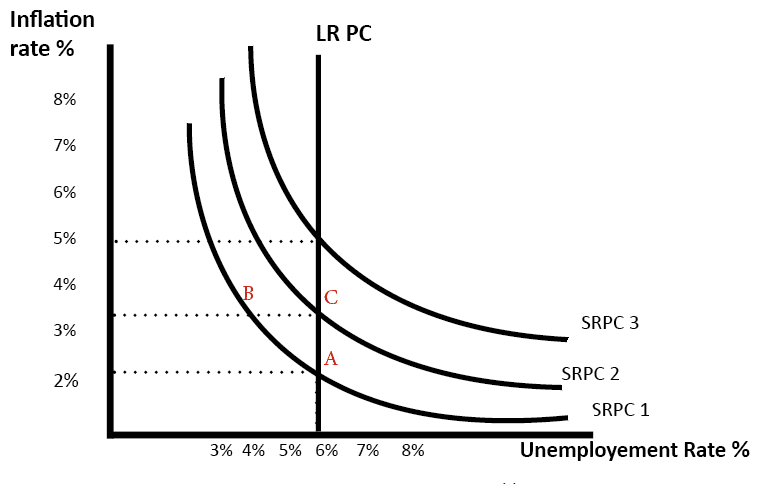 A look at the extent to which policymakers face a trade-off between unemployment and inflation. 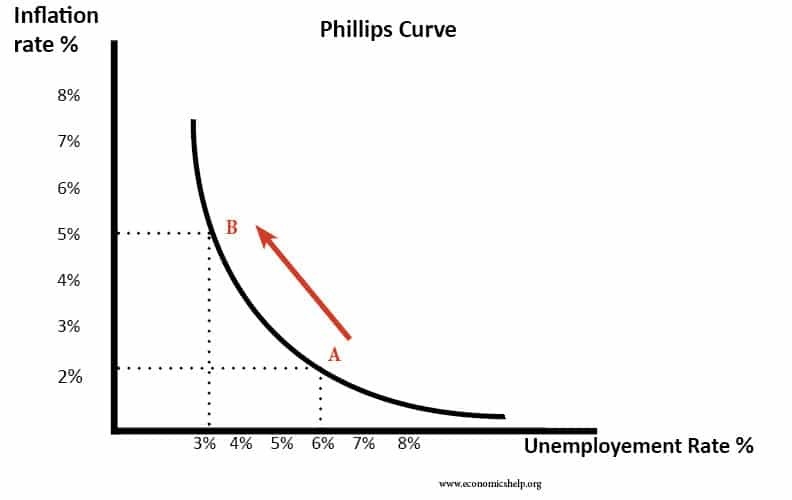 The Phillips curve suggests there is a trade-off between inflation and unemployment, at least in the short term. 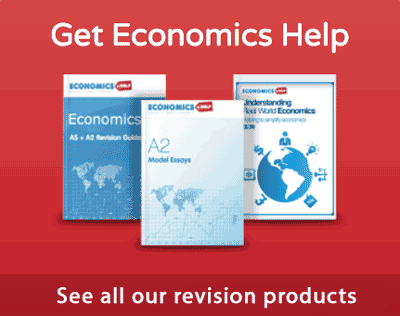 Other economists argue the trade-off between inflation and unemployment is weak. If the economy experiences a rise in AD, it will cause increased output. 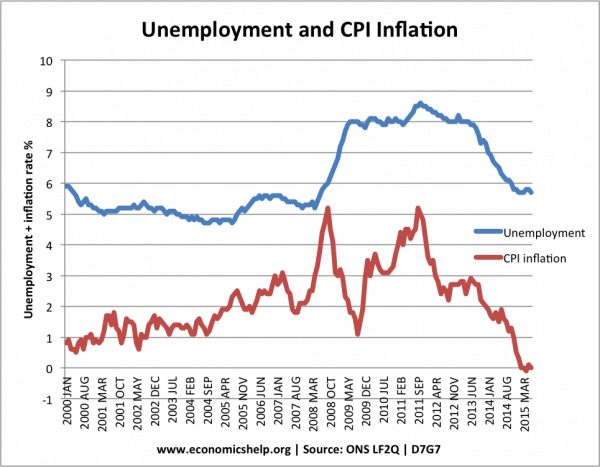 As the economy comes closer to full employment, we also experience a rise in inflation. Thus with faster economic growth in the short-term, we experience higher inflation and lower unemployment. 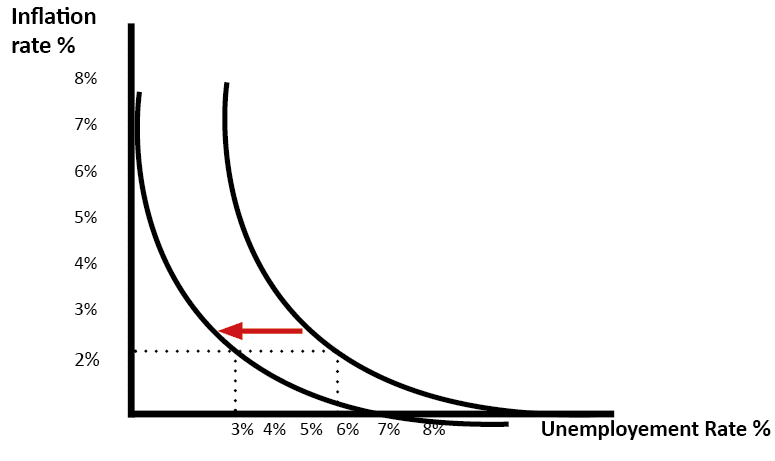 This Keynesian view of the AS curve suggests there can be a trade off between inflation and demand deficient unemployment. In this Phillips curve, the increase in AD has caused the economy to shift from point A to point B. Unemployment has fallen, but a trade-off of higher inflation. If an economy experienced inflation, then the Central Bank could raise interest rates. Higher interest rates will reduce consumer spending and investment leading to lower aggregate demand. This fall in aggregate demand will lead to lower inflation. However, if there is a decline in Real GDP, firms will employ fewer workers leading to a rise in unemployment. 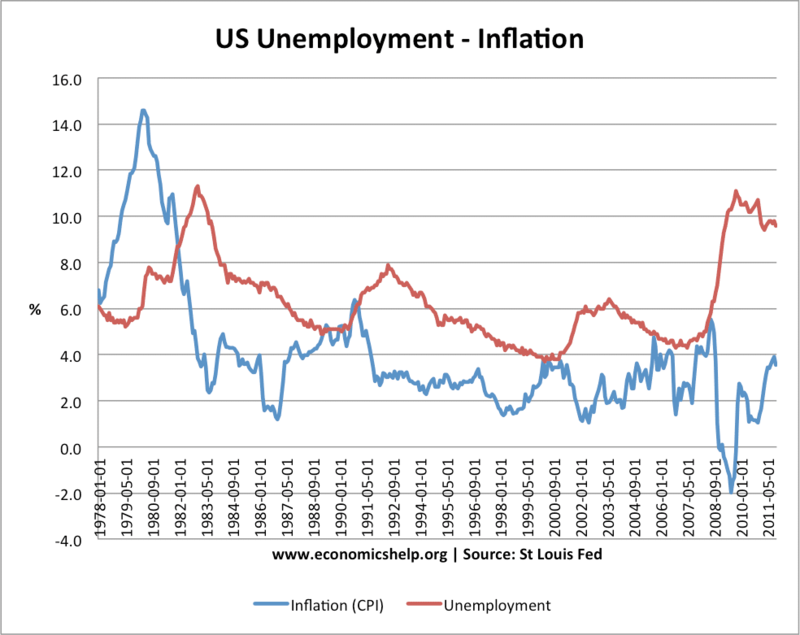 This graph shows unemployment and inflation rate for the US economy. There are occasions when you can see a trade-off. For example, between 1979 and 1983, we see inflation (CPI) fall from 15% to 2.5%. During this period, we see a rise in unemployment from 5% to 11%. In 2008, we saw inflation fall from 5% to 2%. During this time, we see a sharp rise in unemployment from 5% to over 10%. This suggests there can be a trade-off between unemployment and inflation. However, equally you can look at other periods, and the trade-off is harder to see. % annual change in inflation and unemployment. The Phillips curve is criticised by the Monetarist view. 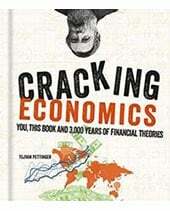 Monetarists argue that increasing aggregate demand will only cause a temporary fall in unemployment. In the long run, higher AD only causes inflation and no increase in real GDP in the long term. 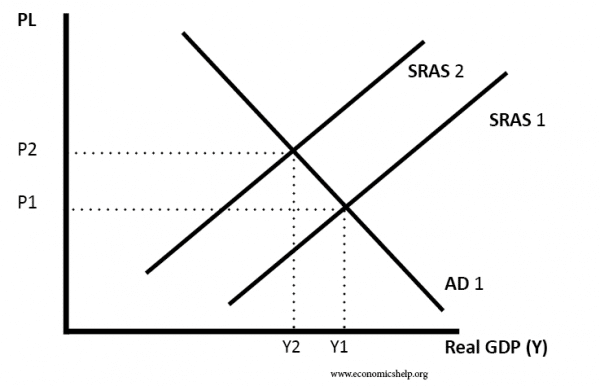 Rational expectation monetarists believe there is no trade-off even in the short-term. They believe if the government or Central Bank increased the money supply, people would automatically expect inflation, so there would be no improvement in real GDP. In some periods, we have seen both falling unemployment and falling inflation. For example, in the 1990s, unemployment fell, but inflation stayed low. This suggests that it is possible to reduce unemployment without causing inflation. 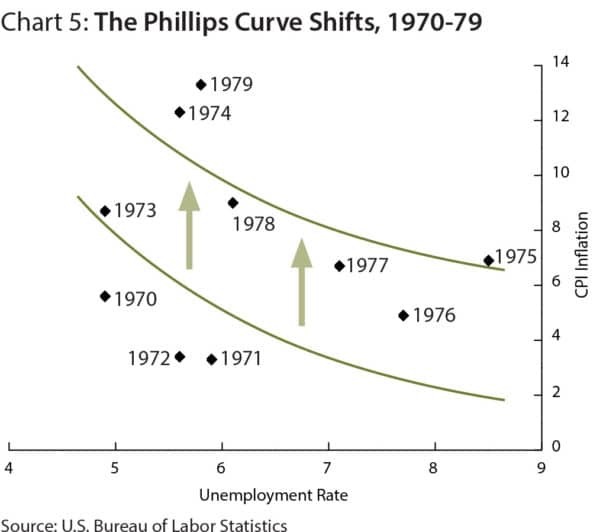 However, you could argue there is still a potential trade-off except the Phillips curve has shifted to the left, because there is now a better trade-off. It also depends on the role of Monetary policy. 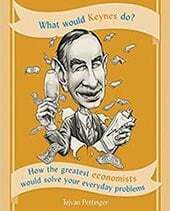 If monetary policy is done well, you can avoid some of the boom and bust economic cycles we experienced before, and enable sustainable low inflationary growth which helps reduce unemployment. It is also possible to have a rise in both inflation and unemployment. 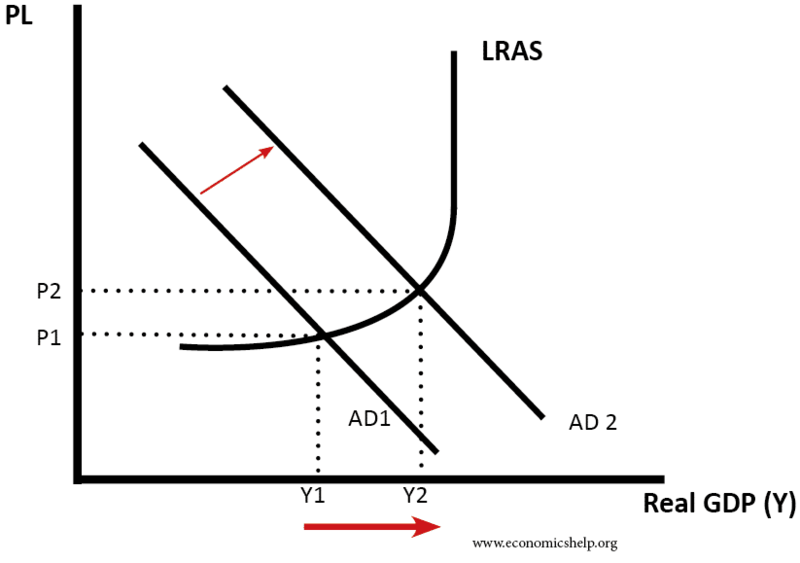 If there was a rise in cost-push inflation, the aggregate supply curve would shift to the left; there would be a fall in economic activity and higher prices. For example, during an oil price shock, it is possible to have a rise in inflation (cost-push) and rise in unemployment due to lower growth. However, there is still a trade-off. If the Central Bank sought to reduce the cost-push inflation through higher interest rates, they could. However, it would lead to an even bigger rise in unemployment. In 1970s, a period of cost-push inflation led to breakdown of Phillips Curve – or at least gave a worse trade-off. Should low inflation be the primary macro objective? 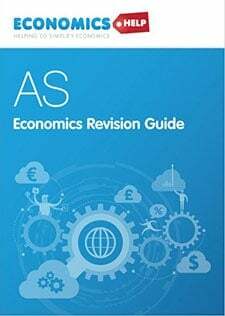 Discuss whether demand-side policies reduce unemployment? This entry was posted in unemployment and tagged inflation, unemployment. Bookmark the permalink. We just learned about the Aggregate Demand and Aggregate Supply Curves in my AP Economics class. Your article provides a greater insight into the concepts. 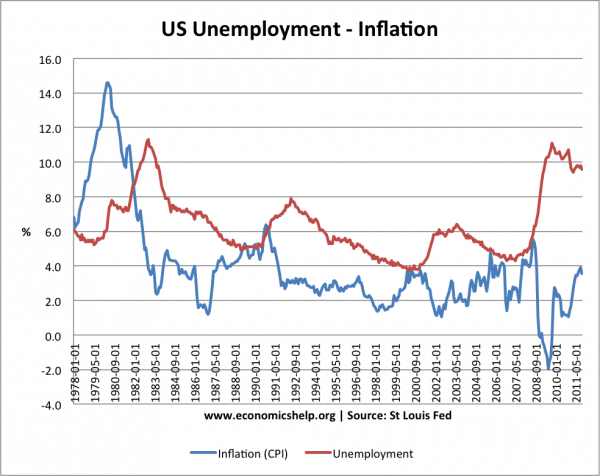 The relationship between unemployment and inflation is explained well. It’s important to have good monetary policy and I hope the new government makes the adequate modifications to get the economy out of the recession. please send me the original work of A W Phillips if you have it. I need it for my project work. 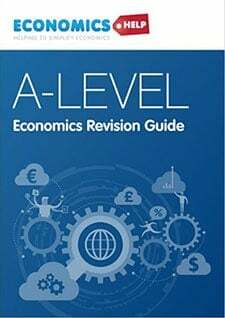 I’m a 4th year student in the department of economics in the University of Nigeria.